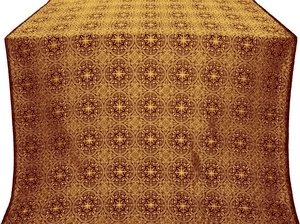 Shouya metallic brocade (claret/gold) - Istok Church Supplies Corp. Excellent metallic brocade, B class. Width: 63.0'' (160 cm). Repeat size: 6.5''x6.9'' (16.5x17.5 cm). Composition: 35% metallic thread, 30% poliephir, 35% acetat. Price shown is per 1 meter. I just wanted to thank you for the lovely vestments! Even ordered on short notice, they arrived in time to be blessed before the Nativity of Our Lord God and Savior Jesus Christ! Thank you so much! I'm so pleased that I will be placing another order! Thank you very much, i received my order today and it is all right and complete. I am very happy with the goods. Thank you for the great customer service! May Paradise consume us! My Violet/ Gold Vestment is absolutely BEAUTIFUL!!! Thank you so much, it really worth waiting for! Glory to Jesus Christ! Dear folks at Istok! I received my order in good shape and all seems well with it... thank-you for your good service once again! Thank you very much. You are both efficient and courteous, and I very much appreciate both. I recieved my vestment today and the quality and integrity are extraordinary! I am very thrilled with the products I received. We received all our candle-stands. You did a great job packaging all of the items. Thank you! Thank you so much! I recieved icons today, so beautiful! !